Hello friends! Today I've got a cute card that I made using my Rubbernecker stamps and some new supplies I received for Christmas from my wonderful hubby! I hope you all had a wonderful Christmas - I sure did! Every year it seems to pass so quickly and this year we made a point to enjoy every day leading up to it! I can hardly believe it is over and now we're thinking about the new year! For our "try something new" challenge at The Kraft Journal this week, I decided to create something new from something old - vintage dictionary pages and made this matching paper bow tie and party hat ensemble! Shhhh, don't tell anyone, but my husband and I actually tried them on and they're really pretty cute and would be fun to to wear to ring in the new year! I found the tutorials on Kate's Paperie and finished them with seam binding and stick pin accents. 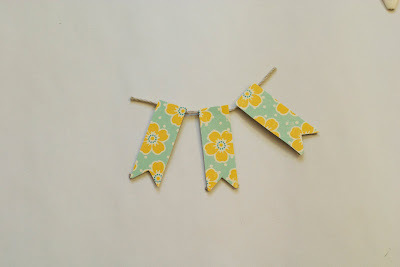 I hope you have some time to get crafty this week and I can't wait to see what you link up for this challenge! Have fun!! Merry Christmas, friends! I hope you all had a wonderful day filled with joy and laughter! It is so special to me to share this day with my husband and family (at least virtually) and to celebrate the birth of Jesus! 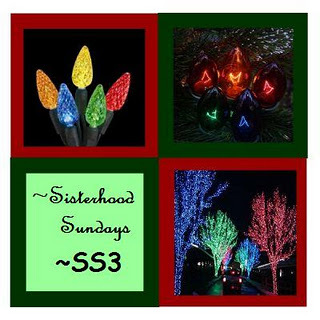 We had a wonderful night out looking at lights last night and a lovely day today! Now, we're waiting for the ham and potatoes to be finished so we can eat yummy dinner! Hello friends! How are you all doing this last weekday before Christmas? I've been off work the past two days and it has been wonderful! I volunteered in the Salvation Army kitchen on Thursday preparing Christmas meals and got a haircut today and am officially all set for Christmas on Sunday. Tomorrow we are going to Christmas Eve service at Grace Cathedral and then drive around the city looking at lights. Should be wonderful. Jesus is the reason for the season and what a glorious season it is! Hello friends! I'm sorry it has been so quiet here on the blog lately but (as I'm sure is true with most of you) I've been running around trying to wrap up work and get ready for Christmas! I have a card to share with you today that I made for Gladys, the "mother of the bride" for my dear friend Felicia. 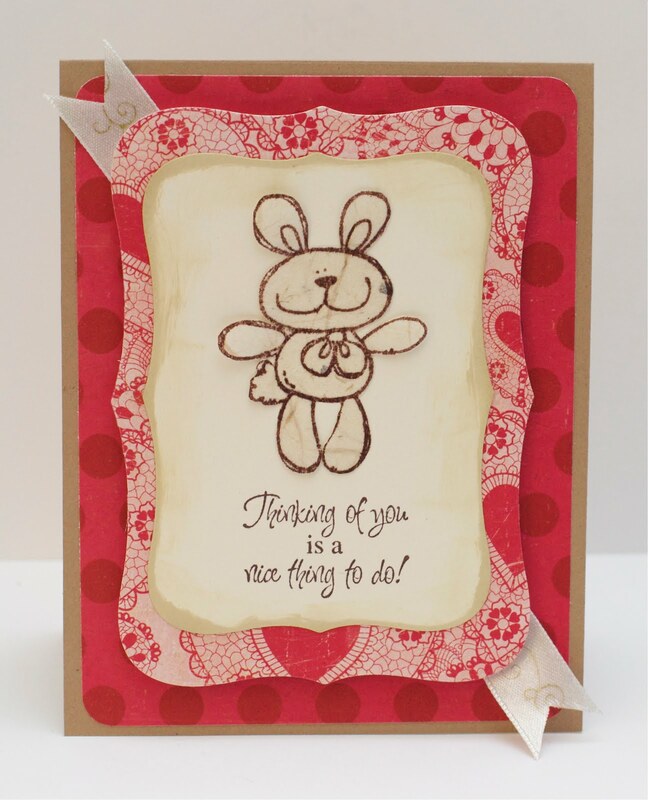 It is such a great feeling to be asked to make a card for such a special occasion! 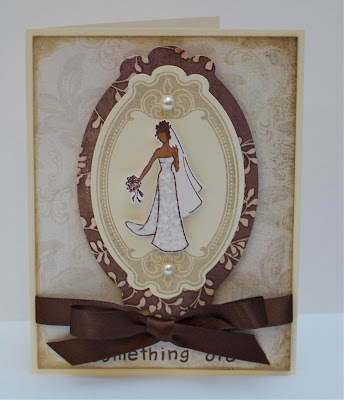 I used an Inkadinkado bride stamp that I colored with my Copics and I covered the dress with chunky glitter, layered it onto some Labels 10 and added the "something old" sentiment at the bottom. Gladys' special gift to Felicia for her wedding day was her grandmother's watch which has been passed down through the women in the family. What a great gift! 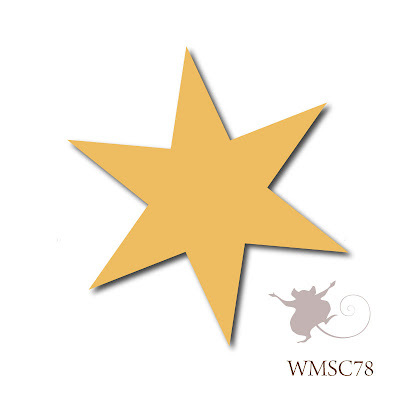 I started with the wonderful star image from Seasons of Love - Tags (one of my go-to sets for sure! 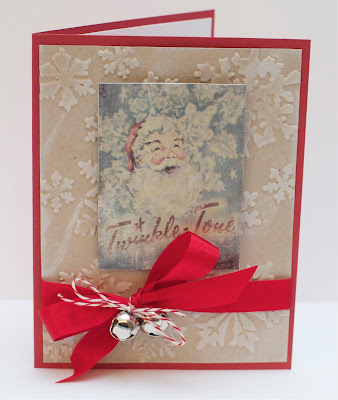 ), stamped it in embossing ink on aqua paper and then embossed it with silver powder. I made a card base with my fabulous new Holiday Style papers and embellishments and then gave it a spritz with my new Mister Huey and I just love the result! 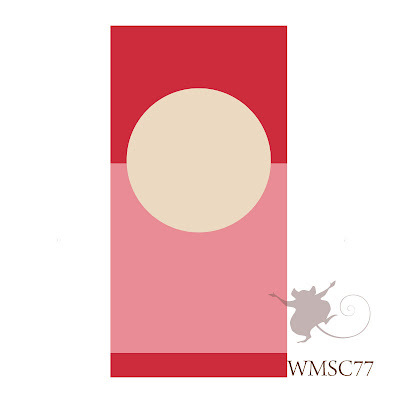 Don't forget to link up by Friday for a chance at being crowned "Top Mouse" and one random participant will win their very own WMS set! Fabby! 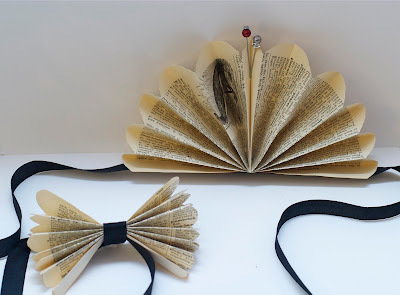 Hello friends and welcome to another wonderful challenge at The Kraft Journal! 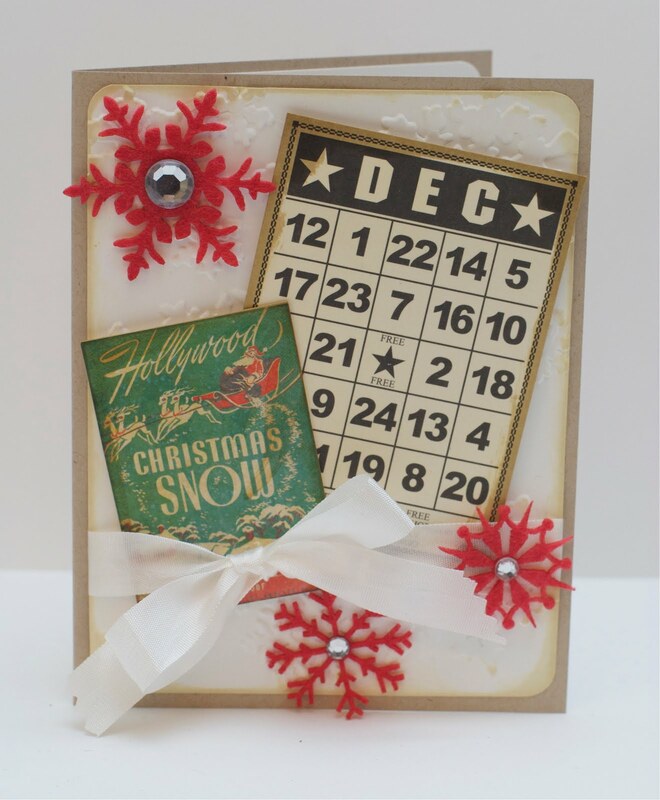 This week we're challenging you to make a project with a "Let it Snow" theme! I know it is getting busy for all of us but I sure hope you can play along. Everyone who enters will be eligible to win a voucher for The Kraft Outlet! 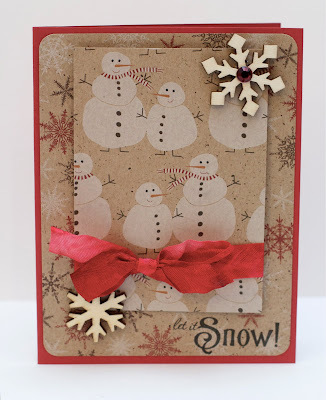 I created this card using a base of light kraft cardstock, added a snowflake embossed panel, a bingo card, and a salvage sticker. I finished it with some felt snowflakes, rhinestones, and a seam binding bow. Hello friends! Today I have a little tag to share with you that I made for this week's Sisterhood Sunday challenge at Rubbernecker Stamps based on this photo inspiration - I used the wonderful Miranda snowman from this season's new releases, cut her out, covered her with a bit of Rock Candy Stickles for some shimmer, and layered her over some wonderful patterned papers and stickers from Crate Paper. 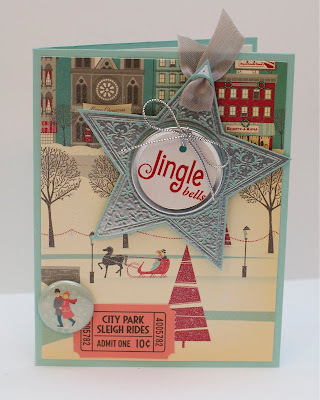 I finished the tag with some little Christmas lights inspired by the photo and some snowflakes stamped in silver ink. I hope you can play along with us! 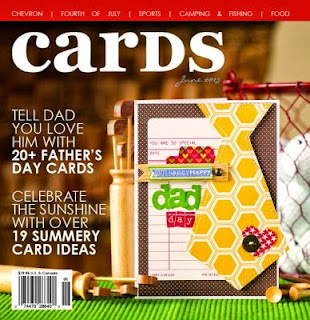 Each entrant is eligible to win stamps! 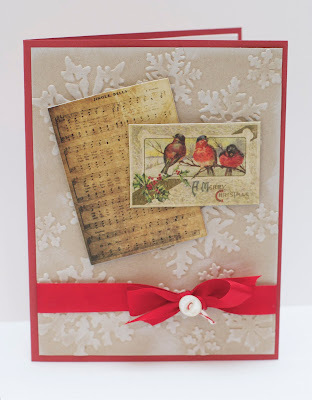 I made this card for Cathy who organized a wonderful card exchange this year! 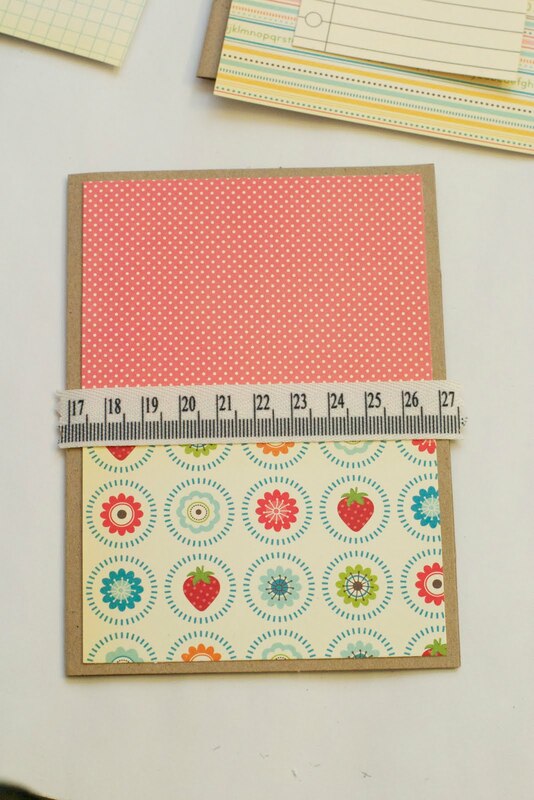 It was so fun to actually make and send a card to someone since I make so many cards that hardly ever get sent! 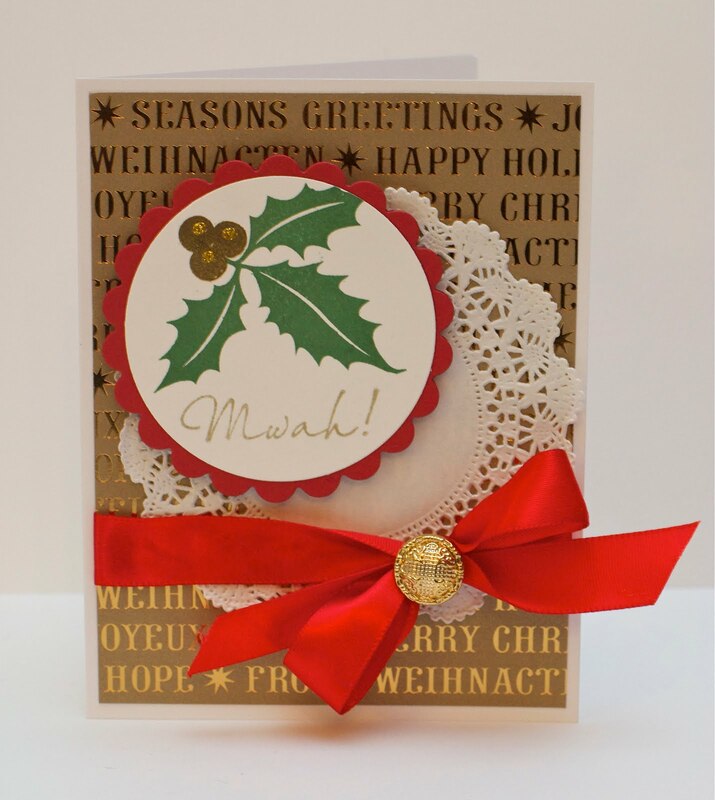 I started off with some great metallic background paper and then layered a couple of die cut circles that I stamped with the holly image from Festive Foliage. I added a doily, some red satin ribbon, and a gold button to finish it off. 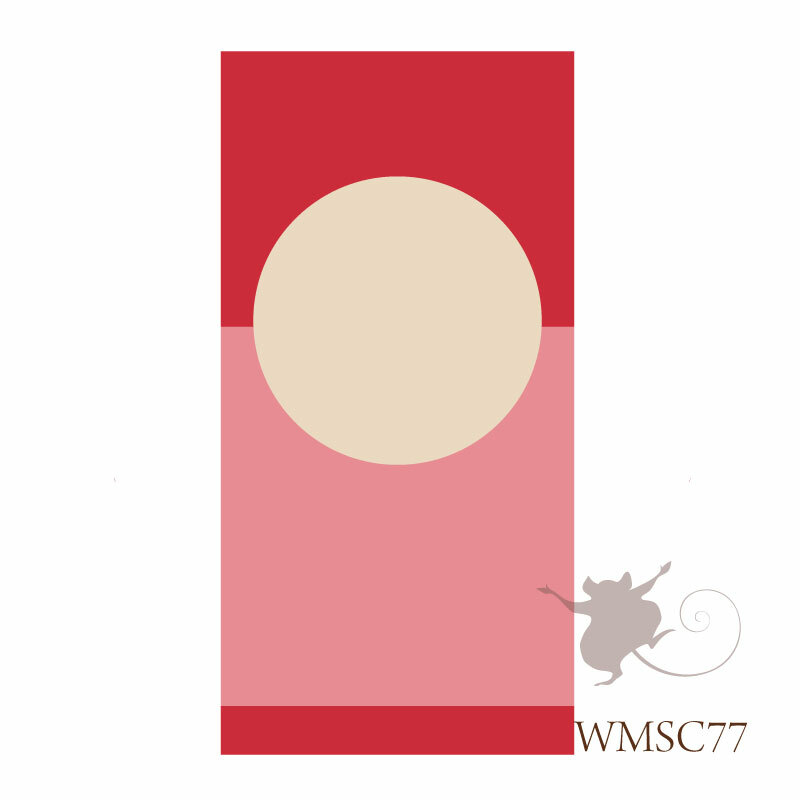 I really like how the red and gold work together and I don't use them as much as I should! Hello friends! Today I have a fun tag to share with you that I made for this month's Verve Diva Dare! It has been so long since I've had a chance to ink up my Verve stamps and this was soooo fun! I started with a large shipping tag that I stamped with the smallest snowflake in the Christmas in the Air set in white craft ink (a little hard to see in the photo.) 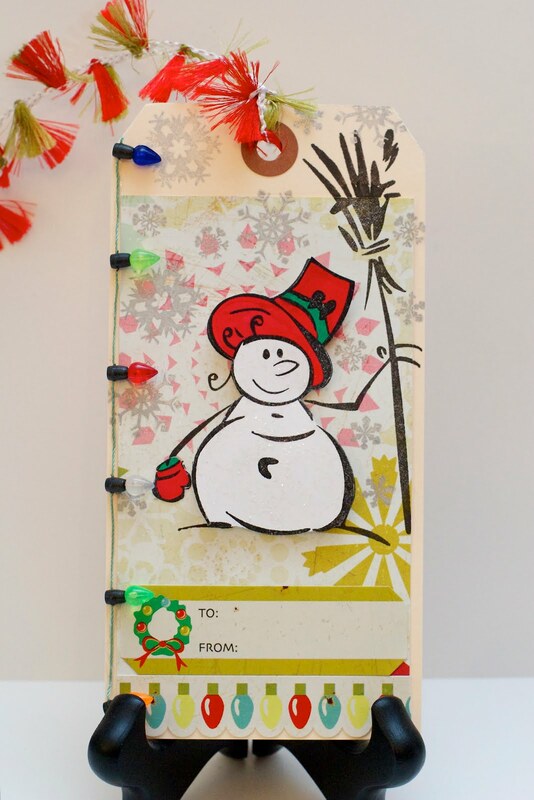 I then tore some white glitter cardstock to represent snowy hills and added a fun tag border. 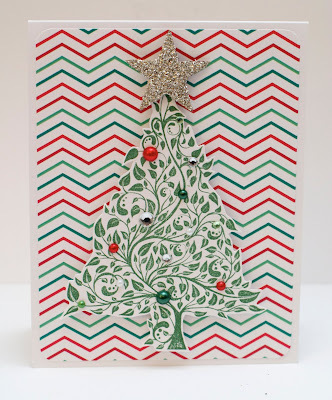 I heat embossed the sentiment and then stamped the wonderful trees which I colored with my Copic markers, covered with chunky glitter, and popped off the card with foam squares! I really love how this little scene came out! Hello friends! 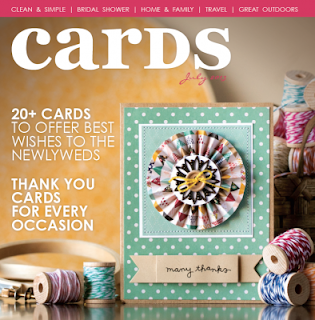 Just a quick post today to share a couple of projects that are featured in the December issue of Cards Magazine! I had so much fun making this little window scene card using my Half Pint Heroes and Way out West stamps from Waltzingmouse and the wonderful To the Moon collection of papers and embellishments from October Afternoon! 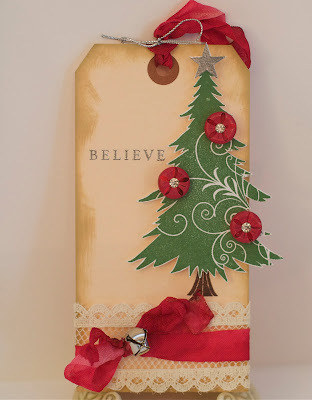 I made this tag using a large shipping tag from Uline, stamps from Papertrey Ink and some vintage rhinestone buttons! Happy Monday, friends! I sure hope you had a wonderful first weekend of December! Did you do any holiday prep? We sure did! Because we live in a small apartment, we keep our Christmas decorations in a storage unit and so we did the decoration shuffle! We now have everything at home and just need to get our tree! 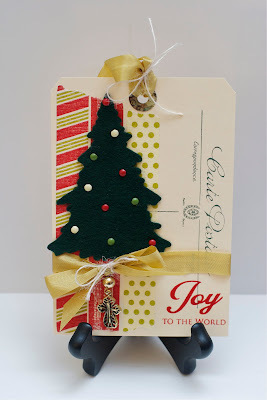 Okay, on to the business of the day - our new challenge at The Kraft Journal - Christmas tags or gift card holders! 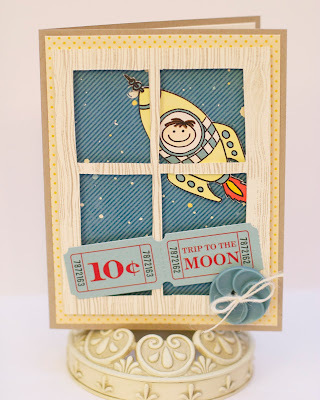 I created this oversized tag from a postcard tag base that I covered with three strips of paper tape and a couple of reinforcers and stamped with a wonderful sentiment. 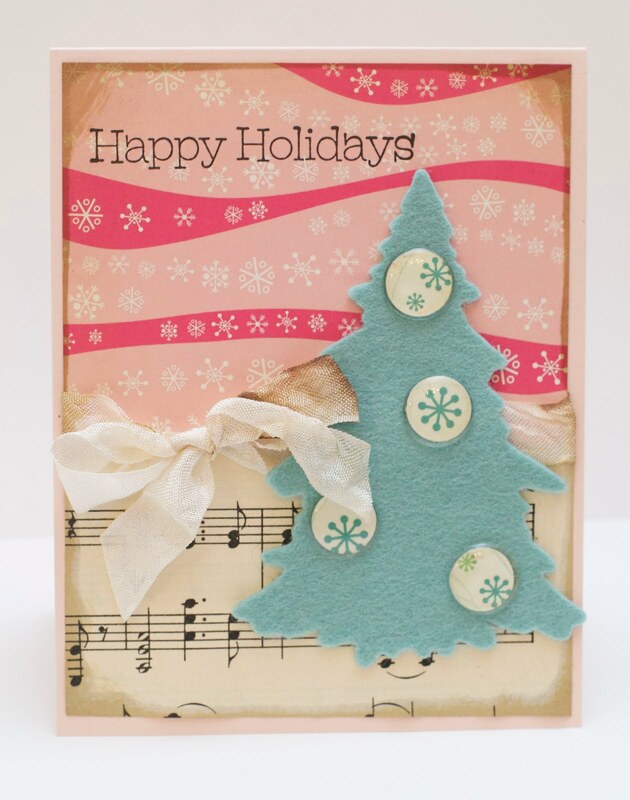 The felt tree was covered with brad "ornaments" and the card was finished with a seam binding bow and cross charm. I can't wait to see what you come up with for this challenge! Link up by Sunday night for a chance to be chosen one of our Top 3 and for a chance to win a voucher for The Kraft Outlet! Yay! I decided to take a little break from Christmas crafting to make a tag for my sister's birthday present! Having a mid-December birthday has always been tough for her with "combo" Christmas and birthday gifts so I always try to make it special. I cut the tag base from a sheet of balsa wood for some texture and added strength then used some Perfect Pearls along with the Flourishes set for some shimmer. 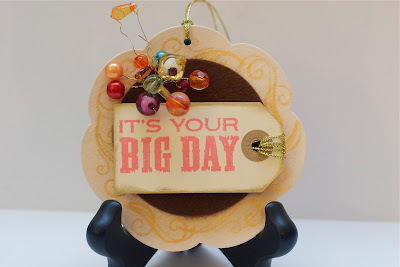 I cut a circle of brown felt and then added a stamped tag and a wonderful spray of gems for the grand finale. I think it will glam up any package!! I sure hope you can play along with us this week and I can't wait to see your take on this wonderful sketch! Hello friends! 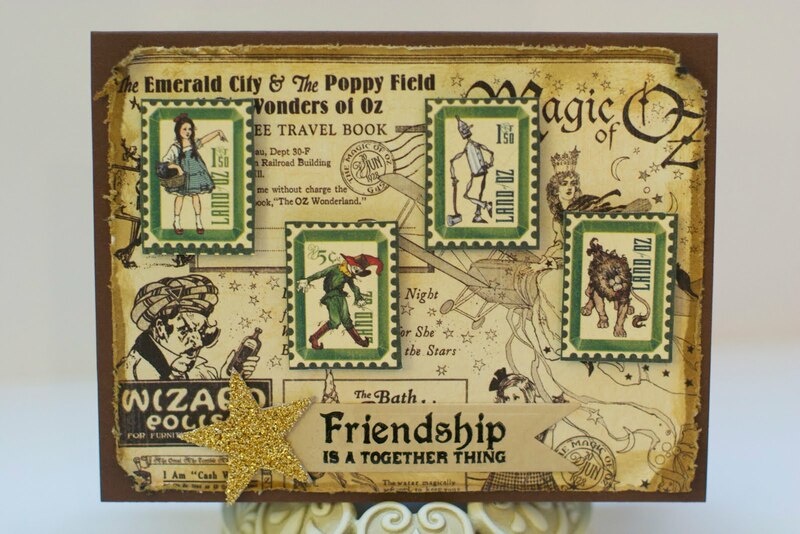 Just a quick post tonight to share this cute little Oz-themed card with you as well as to congratulate the winner of the two Sassafras stamp sets from my Thanksgiving post! Terriavidreader was the winner and I've already contacted her to let her know she won! Hello friends - I hope you had a wonderful weekend! 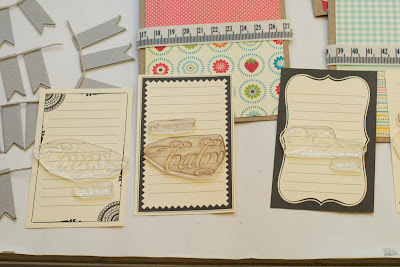 It is Monday and that means it is challenge day at The Kraft Journal! This week we're challenging you to get started making Christmas cards! 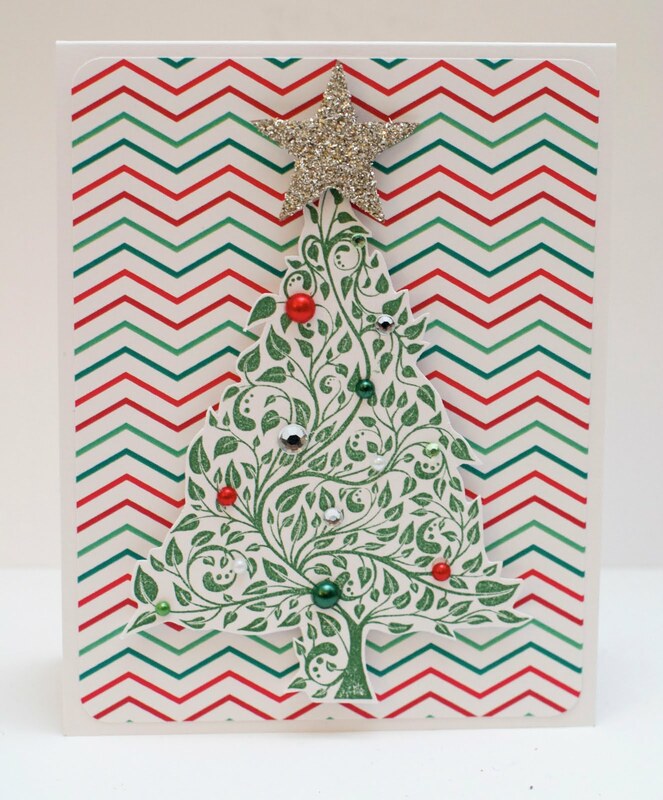 I created this Christmas card using a panel of light craft cardstock that I embossed and brushed with white craft ink. 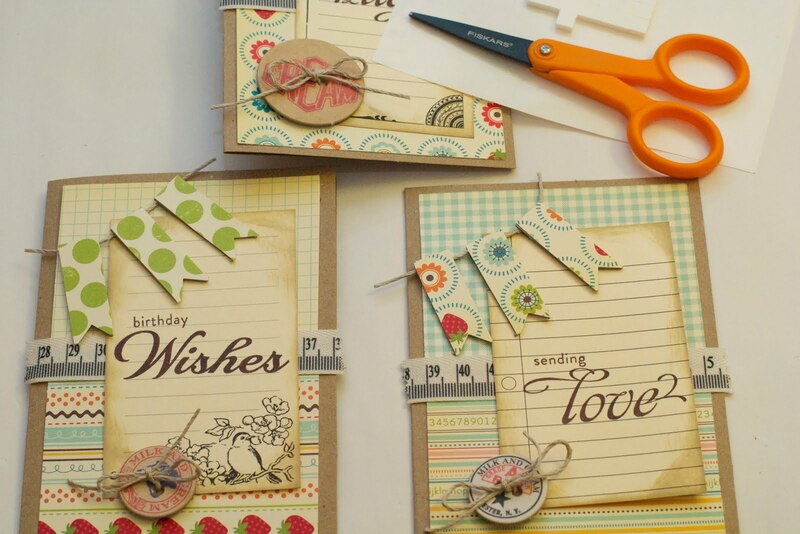 One of the tricks I like when using these vintage-inspired stickers is to stick them on to a piece of cardstock and then cut them out with some scissors. 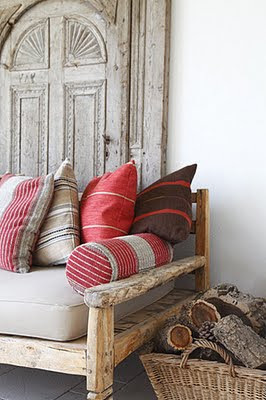 I find that gives them a lot more versatility and dimension. 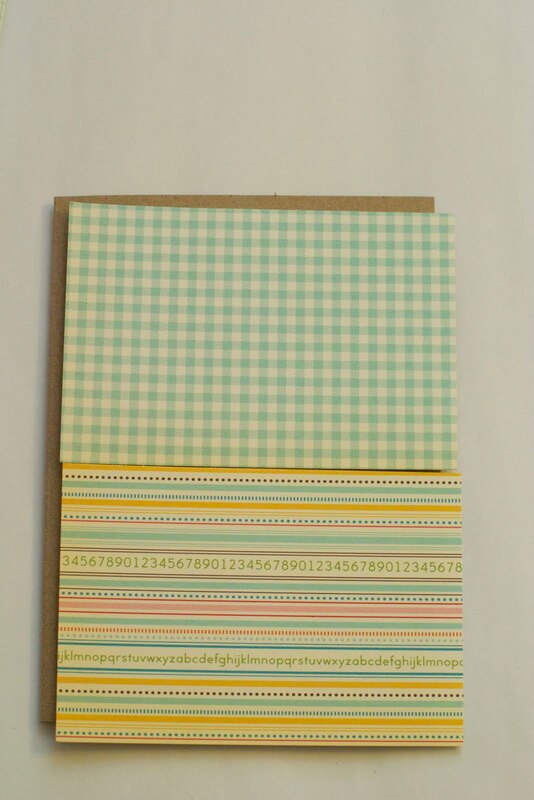 For example, I cut this one out and attached it to the front of the card using foam squares. 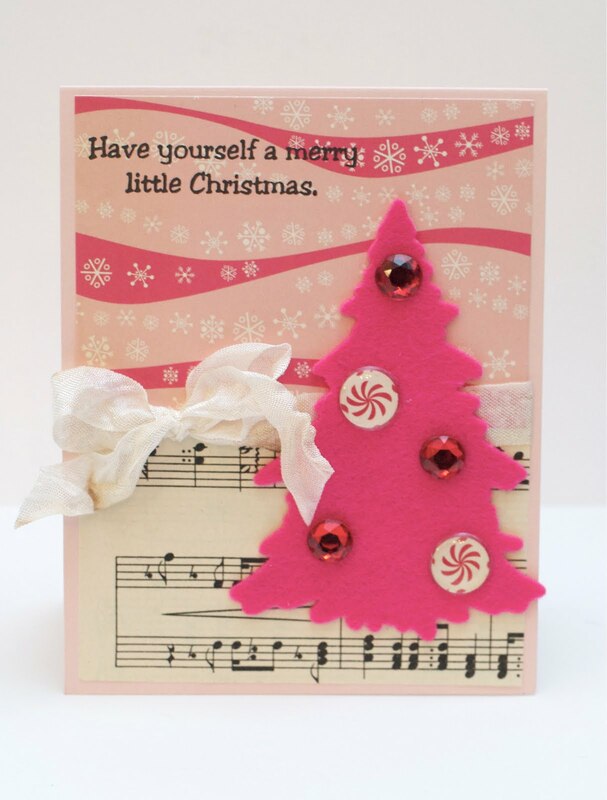 I finished the card with a seam binding bow and some lovely jingle bells attached with baker's twine. 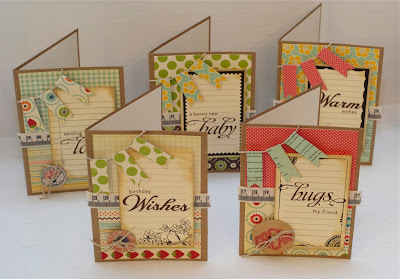 Something I read out in "blog land" once was why make one card when you can make two? I don't always make multiples but with Christmas right around the corner, I went ahead and made a second one using similar ingredients but because the bow was smaller on this card, I finished it with a button instead of the bigger bells. I can't wait to see what you create for our challenge this week! 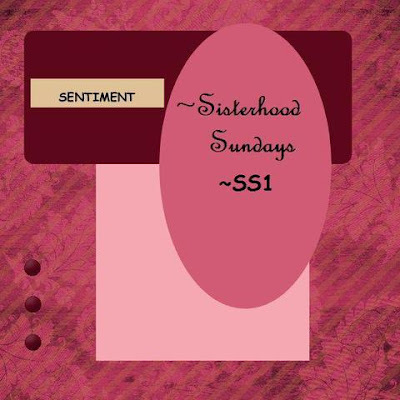 Link up by Sunday night for a chance to be named Top 3 and/or to win a $15 voucher for The Kraft Outlet! 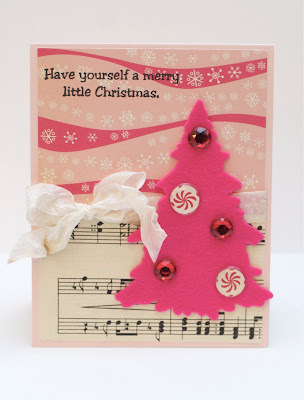 I made this card using a felt die cut, some vintage sheet music, and the "Merry Little Christmas" sentiment stamp. I finished the card with some epoxy stickers, some red rhinestones, and a shabby ribbon. Thanks for visiting and I can't wait to see what you create with this fun sketch! Oh, and if you haven't seen my Thanksgiving post, head over there for a giveaway! I have been so blessed to have so many supplies, my cup (and my craft room) runneth over! Happy Saturday, friends! I hope all of you here in the US had a lovely Thanksgiving and are recovering nicely from all of the food and Black Friday! I loved the idea of making place cards and don't have the alphabet set yet so thought I'd stamp some small sentiments instead. 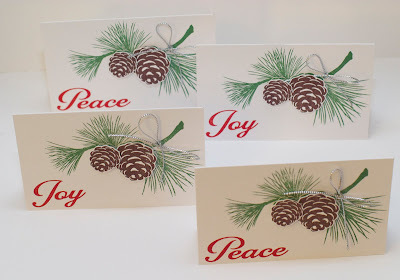 I think this maked these placecards so versatile, especially if you have 2 friends named Peace and 2 friends named Joy... ba dum dum... 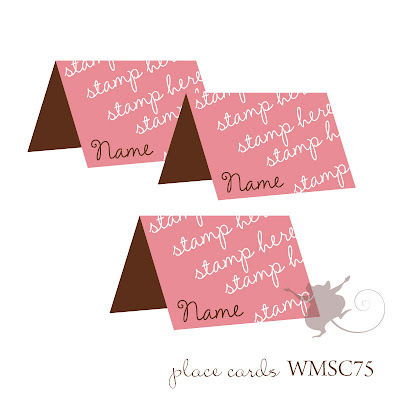 Seriously, these would be wonderful for a table or also wonderful attached to a package using two sided tape as gift tags! I am so excited to see all of your creations this week! 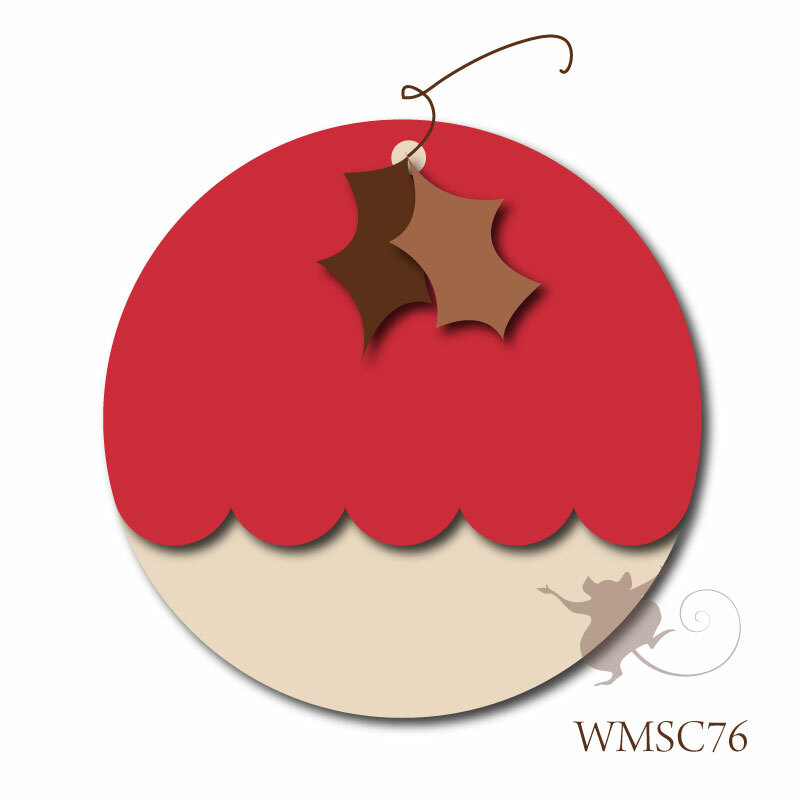 I've been making scores of tags for holiday packages and can't wait to see what you make! Oh, and if you haven't seen my Thanksgiving post, head over there for a giveaway! I have been so blessed to have so many supplies, my cup (and my craft room) runneth over! Happy Thanksgiving! This year I am so blessed to be spending the holiday "just the two of us" style with my husband! I certainly miss our family on this special day but we've had a lot going on lately and needed a little getaway of our own! 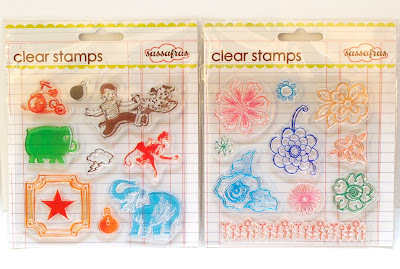 I am so in love with the "Little Lovin's" stamps from Rubbernecker! Isn't this little pilgrim girl adorable with her little turkey? I don't think that bird has anything to worry about! 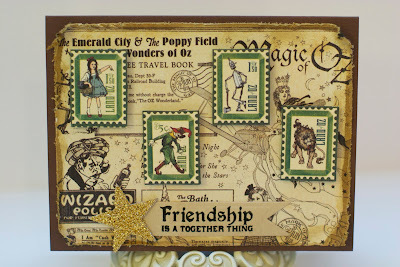 :) I stamped and colored her with Copics to match the lovely Crate Papers and added some glittery leaves and acorns. The sentiment was stamped in my favorite orange, Dusty Durango. I have been beyond blessed in my crafty pursuits this year and wanted to share a little back with all of you! 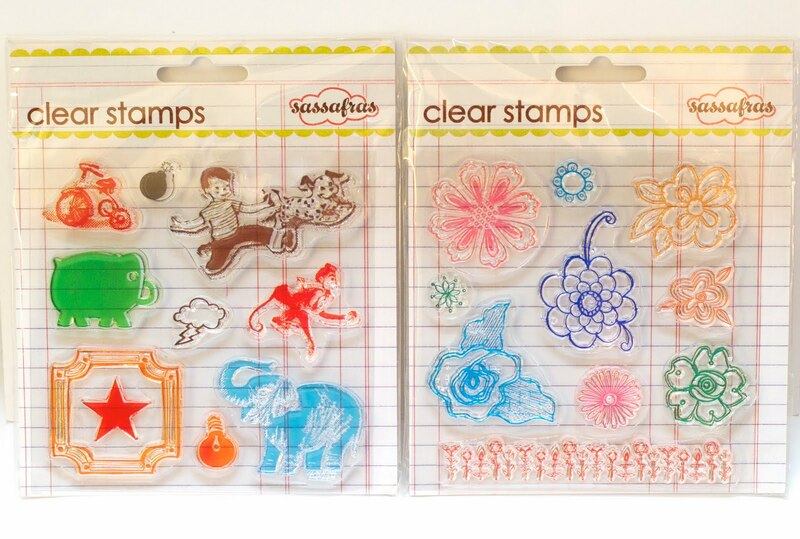 You all literally make my day with the lovely comments you leave here and I want to give one of you these two sets of Sassafras cling stamps! All you have to do is leave me a comment on this post by 11:59pm this Sunday (11/27) saying what you're thankful for this year! I can't wait to hear about all of your blessings! 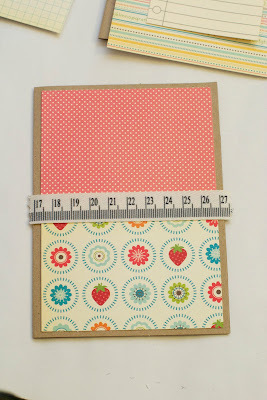 :) I'll draw a random number to win these two sets and will announce the winner here on the blog on Tuesday! Hello friends! Today is tutorial day at The Kraft Journal and I'm going to show you how to make a set of notecards to go along with this week's "Christmas Gifts" challenge theme. 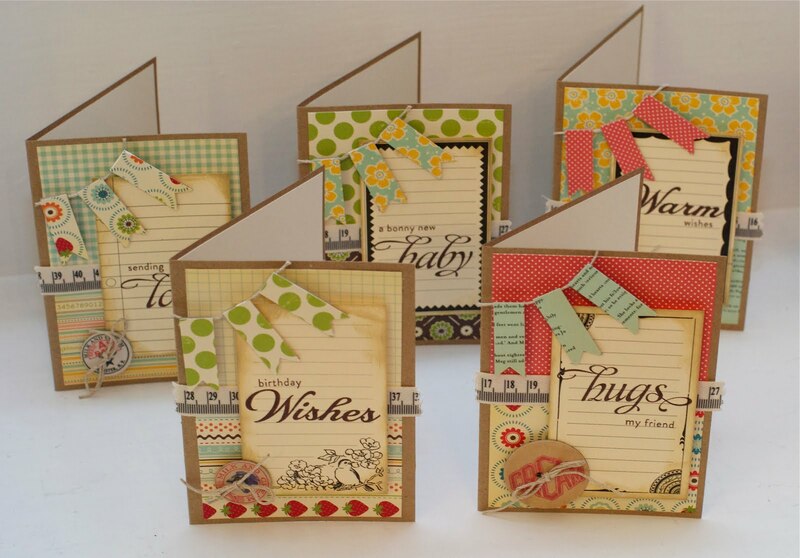 As a cardmaker, I love to give out sets of cards for others to use. 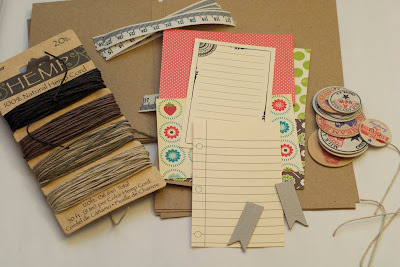 For these, I started out with the lunch bag kraft notecard/envelope set chose some coordinating journaling cards, hemp cord, chipboard banners, ruler twill ribbon, and chipboard milk bottle caps. 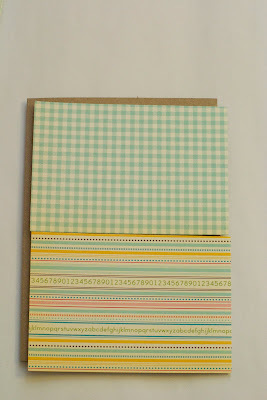 I chose the Fly a Kite collection papers from October afternoon and cut them to fit the notecards. 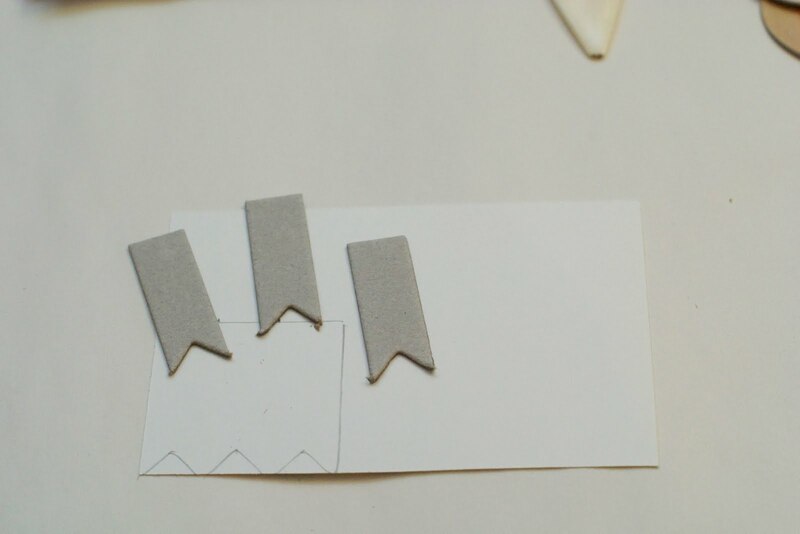 I wanted the banners to coordinate so I traced them onto coordinating papers, cut, out and adhered to the chipboard pieces. After the banners were covered, I glued them to the hemp twine. 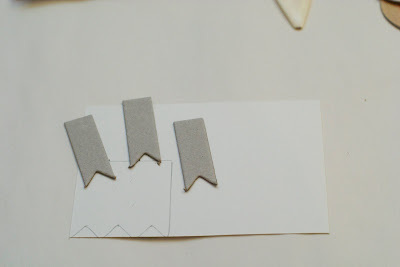 Once I cut the papers down to size, I adhered them to the notecards and glued the ruler ribbon over the seam. 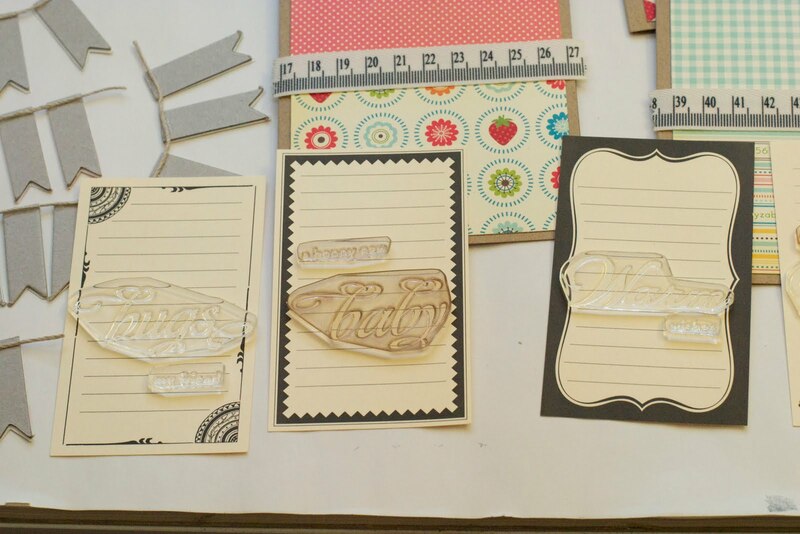 I stamped the journaling cards with some versatile sentiments. I tied the chipboard milk caps with the hemp cord, layed out the elements, and fastened everything down. I plan to give this set to my mother in law and think she'll love them and find good uses for all of them!